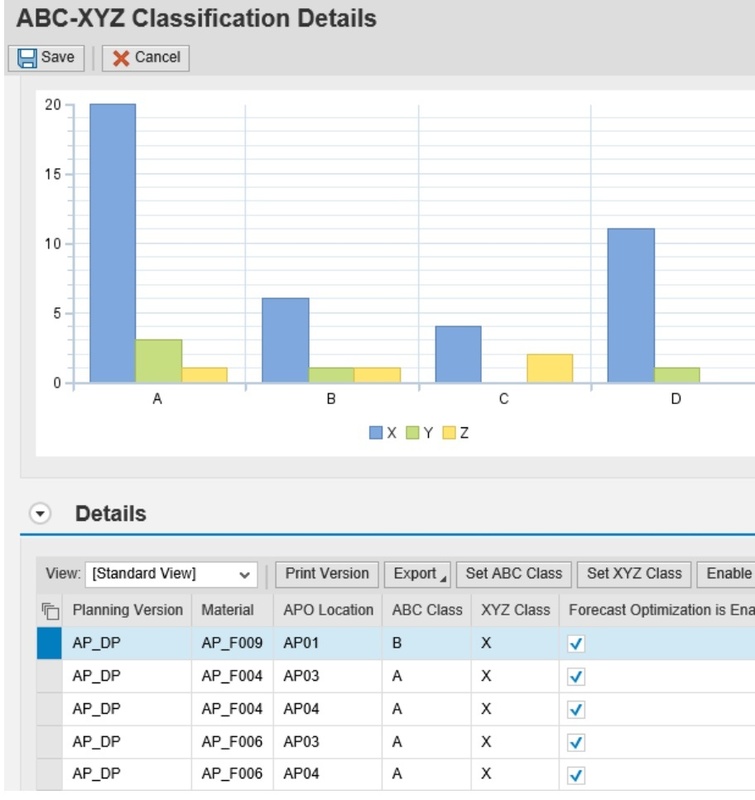 ABC-XYZ functionality was first introduced in Enhancement Pack (EHP) 2 of SAP SCM 7.0 (note APO sits within the SCM product from SAP) and was included in a suite of tools made available under the forecast accuracy improvements area. This segmentation tool will group forecast combinations (CVCs) together based on their sales/revenue value and the forecastability of sales. 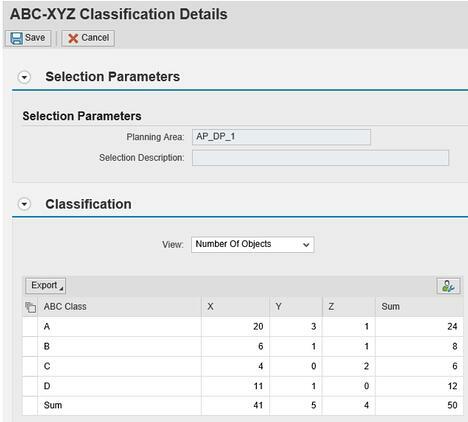 The planning object for ABC-XYZ is setup based on the characteristics within the CVC and needs to be defined with configuration. Note that it is not possible to set up a planning object against a navigational attribute. The calculation for the ABC dimension is completed using Pareto's rule on each planning object within a specific time range. Pareto’s rule defines that 80% of the effects come from only 20% of the causes. An example of this may be 80% of sales value coming from only 20% of the product base. Using Pareto’s rule allows demand planners to focus on which products are driving this 80%, with the rest of 20% of focus being managed by exception. C - the least given number of objects which product the least value - the rest! The ABC tool has the flexibility to allow user defined splits for the classes and the ability to add extra classes if required, e.g. 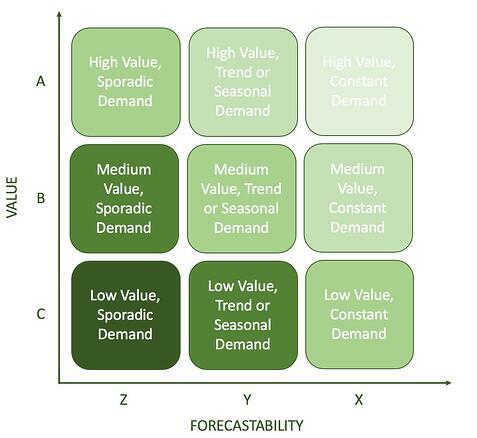 A, B, C, D.
Adapted from SAP help - although note here we use 'Forecastability' on our x axis meaning X products are on the right. 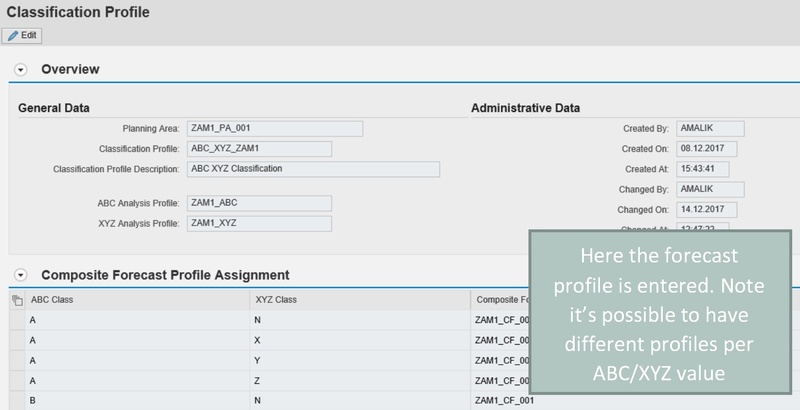 Once the ABC-XYZ tool is ran, the results are available to see in the system which you can see either as a list or graphical representation of the amount of combinations with an ABC class or XYZ value. You can also override the results or can export the results to excel. You can also bring in the combinations into the planning book by selecting the planning level (set up in the ABC-XYZ configuration). Once the selections profiles have been setup, these can be used in the background jobs. You can also use the classifications results to fill navigational attributes, export to BW for reporting, and update the SAP APO SNP product/location master data. ABC-XYZ tool also allows the system to find the most optimised forecast profile to be used based on pre defined forecast profiles. The forecast profile assigned is a GUID profile – this allows the demand planner to load the profile which has been assigned to the selection and make further changes (example: change the alpha factor) without changing the original forecast profiles setup by the system adminstrator. 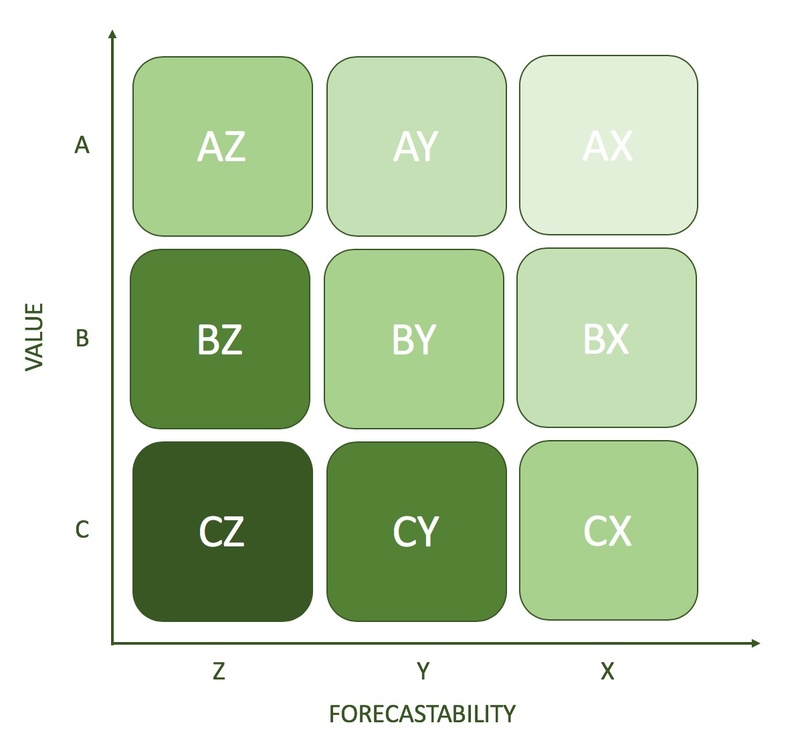 The ABC-XYZ forecast optimisation tool is a very handy tool which can be used to go live for statistical forecasting. 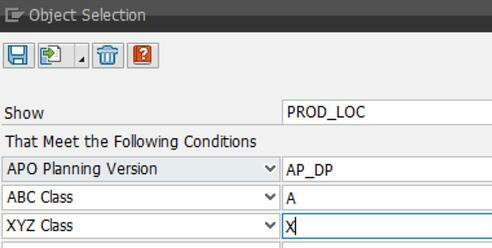 Within the tool there is an option to run the optimisation for new combinations only. This is very important, as if this option is not selected, the optimisation will run for all combinations and potentially assign new forecast profiles to the selections. Segmentation is a very powerful and flexible approach to help enhance the approach to planning. Integration teams can worry less about having to pull this information from ECC or other sources and planners can have the confidence that they have a tool available which can be tailored and adjusted to their requirements. ABC-XYZ forecast optimisation tool brings a welcome addition to an already powerful statistical forecasting tool set available within SAP APO DP. 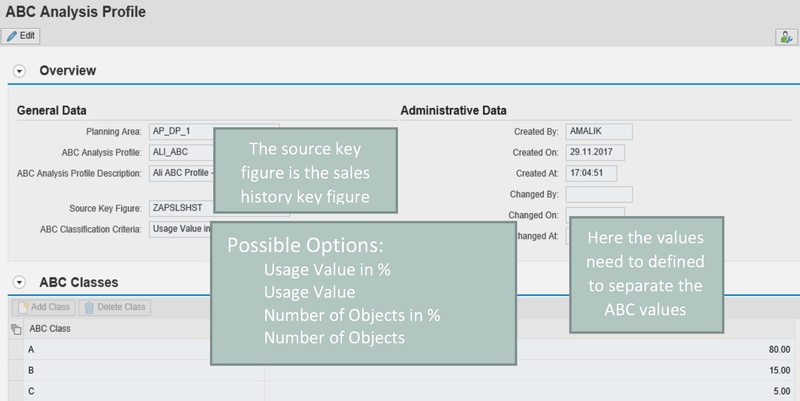 Integrating the ABC-XYZ results within SAP APO master data allows the inventory and supply planners to help optimise their processes too. If you have any queries or comments on this topic, please don't hesitate to contact me on ali.malik@olivehorse.com.